It’s not only about strobe lights and dry ice, and, in the end, certainly not about girls and drugs; for these 4 erstwhile schoolmates from the small town of Fredrikstad in Norway, it’s about nothing less than changing the world with 4 minutes of magic in every song they pull from their hearts. 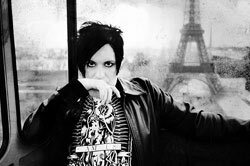 In 2009, Apoptygma Berzerk left home to tour their latest album - Rocket Science - around the world for more than 9 months. It was their biggest, most extensive, most exhausting tour to date; they were met by ecstatic audiences, die-hard fans in every country, they found people to love and people to learn from, there was laughter and tears and in the end there was tension caused by different lives finally taking different turns. Shortly after this show, Stephan Groth, Geir Bratland, Angel and Fredrik Brarud agreed that they would not be returning to the stage together. In this constellation, they would no longer perform the songs that made them the people they are, the people they have grown into since they were kids. Accept this DVD/CD with joy, a document that celebrates 4 passionate men having a ball, entering some people’s hearts and minds by doing what they love to do. It has been a remarkable journey, so thanks to all of the Apop fans around the world and thanks to everyone who attended the Rocket Science tour. Four musicians who would like to say thank you to their families, their wives and kids for putting up with them and with everything that a road trip entails. Apoptygma Berzerk can look back on a career reaching back to the early nineties of the past century. Six studio albums, as well as now three live albums and four collections of singles, remixes and cover versions are documents of the musical development of the band fronted by singer Stephan Groth. Besides the obligatory über hit „Shine On“ the DVD/CD also contains “Eclipse“ and „Starsign“, both classics in the electronic music scene, as well as the most important tracks from the recent album „Rocket Science“ and – not to forget – „Kathy’s Song“, originally released in 2000 and using “Kathy”, the Vocoder voice of the early Apple Mac, for the vocals in the chorus, resulting in a personal thank you from Apple icon Steve Jobs to Apop mastermind Stephan Groth. of 24 shows with “Unheilig” until the end of January 2011. Apoptygma Berzerk are available for promotion in all locations.